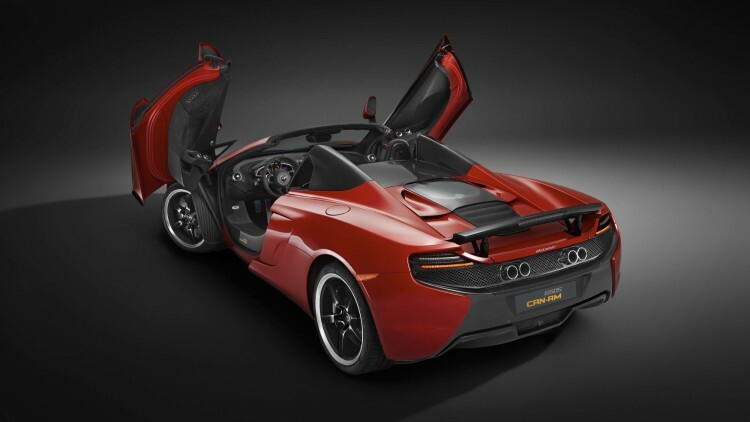 McLaren is bringing one of the greatest periods in its history back to life with a limited run of 650Sspiders that salute the formative years of Can-Am racing. Created by McLaren Special Operations, the 650S Can-Am will mark the 50th anniversary of the series in 2016. It tries to recapture the spirit of the era with a choice of red, orange, and onyx black paint schemes reminiscent of past liveries. MSO used carbon-fiber for the hood, front wings, retractable hardtop, tonneau cover, and air brake. There is also a quad stainless steel exhaust system tuned to give these models their own menacing note. The cabin has sport seats with Alcantara leather, carbon-fiber accents, and a plaque on the driver’s door. The forged alloy wheel design also harks back to ’60s racing, though the wheels are finished in a thoroughly modern gloss-black shade and secured with titanium bolts. The engine is the same mill used by the 650S, a twin-turbo 3.8-liter V8 making 641 hp. Just 50 examples will be sold globally, and they are due to arrive next spring. They will cost $334,500 in the US market. A spokesman couldn’t say how many are coming here. Can-Am launched in 1966 at Mont-Tremblant in Quebec, and McLaren subsequently dominated the series – capturing five straight titles from 1967 to 1971. “Can-Am racing is a major part of McLaren heritage, and this latest model from MSO pays homage to the cars and the racers who played a key role in making the championship such a spectacle during the 1960s and 70s,” Paul Mackenzie, executive director of McLaren Special Operations, said in a statement.